Shorts are cardinal red (burgundy) and gold (yellow) in color. 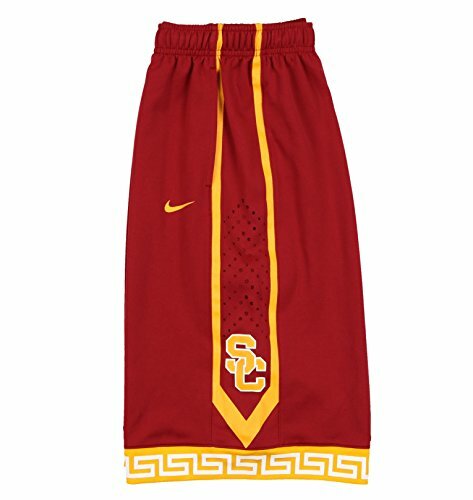 The Nike USC Perforated Training Shorts are made with lightweight, sweat-wicking fabric and perforated panels to help keep you cool and dry during a workout. Dri-FIT fabric to wick sweat away and help keep you dry and comfortable Elastic waist with interior drawcord for a snug, adjustable fit. Ergonomic seams for enhanced range of motion. Side seam pockets with mesh pocket bags for ventilated storage. Large SC design trademark at sides. Fabric: 100% Dri-FIT® polyester. Care: machine washable.